As my internet line bandwidth is terrible every day during „prime time“ (about between 8pm and 11pm) I wanted to create a small test to have a proof to show to my ISP as well as to find out the critical hours. As my ISP always tells me to test with a specific speed test (actually it resides on a web page owned by the provider, giving a small distance in hops), I started analyzing what the speed test really does. The address is called with a parameter called ‚x‘ which is randomized at every new test. syslog.log( "BANDWIDTH"	, "isp", "Unitymedia"
Given the fact that I pay for a 100 mbit line, this is terrible. Of course, I’ll post a longer graph tomorrow when the script has been run for a longer time. 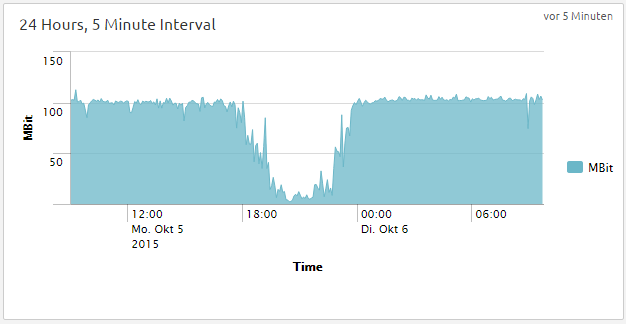 As you can see, there is a huge bandwidth drop starting at about 6pm, lasting until about 1am. This also happend one day before. Additionally, you can see that I never managed to get above 50MBit and I was starting to hunt for a bug in my code but didn’t find one. I modified the code now to use five connections at once (code snipped above is updated), but still there was no large increase. Then suddently the speed test from Unitymedia went down and I was no longer able to test it further so I had to find a new host where I can download test data from. At first, I tried my small V-Server but as you can see, it couldn’t provide enough bandwidth. But after that, finally I’ve found a new host so the tests can continue. As you can see, I finally reach the promised 100 Mbits so this evening will be the first day where you can see the full bandwidth drop. The next image will be posted tomorrow. As you can see, the problem gets worse on weekends. So far, a Unitymedia guy will be here on Wednesday to check my line. Doesn’t make much sense in my case because the SNR levels on the modem look okay, but anyway he will be there. To convert a Perforce depot into a mercurial repository, there are two possibilities: The convert-Extension of mercurial or the Mercurial plugin Perfarce. Both solutions aren’t satisfying because the branches and tags management doesn’t work how it should. Because of this, I started to create an own converter, named p42hg, which will be available as open source soon. It already performs quite well, under Linux as well as under Windows.